In the morning of Feb 15, 2013, a smouldering fire broke was remarked aboard the "Cap San Diego" at the landing piers in Hamburg. The fire broke out during welding works in the insulation on starboard side already on Feb 14 but only next morning the smell of fume was remarked in the cargo hold IV. The fire brigade removed the smouldering insulation and extinguished the fire. The "Cap Sand Diego" on July 24, 2919, around 2.30 p.m. touched the dock wall of the Kiel Canal gates at Brunsbuettel while returning from a visit to Kiel, thereby suffering slight damage to one of the clamps fixed to its port side for mooring it at its berth at the Landing Bridge in Hamburg. One bolt was lost into the basin. 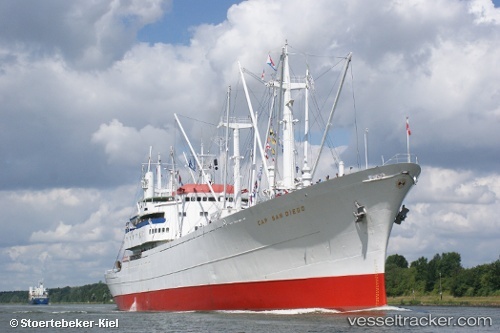 The ship berthed at Cuxhaven Steubenhoeft and returned to Hamburg on July 25 at 5 p.m. at 6.15 p.m.